Power, and consequently energy, has recently attained first-class system resource status, on par with conventional metrics such as CPU time. To reduce energy consumption, many hardware- and OS-level solutions have been investigated. However, application-level information - which can provide the system with valuable insights unattainable otherwise - was only considered in a handful of cases. 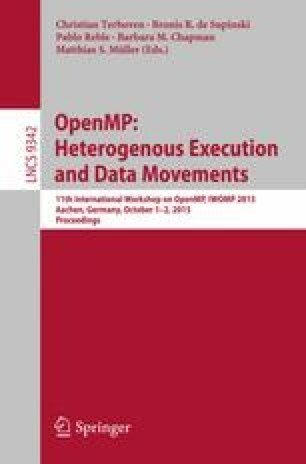 We introduce OpenMPE, an extension to OpenMP designed for power management. OpenMP is the de-facto standard for programming parallel shared memory systems, but does not yet provide any support for power control. Our extension exposes (i) per-region multi-objective optimization hints and (ii) application-level adaptation parameters, in order to create energy-saving opportunities for the whole system stack. We have implemented OpenMPE support in a compiler and runtime system, and empirically evaluated its performance on two architectures, mobile and desktop. Our results demonstrate the effectiveness of OpenMPE with geometric mean energy savings across 9 use cases of 15 % while maintaining full quality of service. This research has been partially funded by the FWF Austrian Science Fund under contract I01079 (GEMSCLAIM).